The Parisian Diet was created by Dr. Jean-Michel Cohen, France’s leading nutrition and weight loss expert. This program outlines a way of living that is based on healthy eating habits of the French people. You will learn to eat with pleasure so you can lose weight without having to strictly avoid any particular food. Cohen outlines the top ten Parisian weight loss secrets, highlighting some of the healthy eating habits of the French. French people experience pleasure when they eat and savor every morsel, which helps you feel satisfied more quickly. Parisians devote at least 20 minutes and up to two hours to each meal. American portion sizes are much larger than those of the typical French meal. Eating meals at the table reduces mindless eating that can occur when your attention is focused on the television while you eat. Parisians prefer to walk or cycle instead of driving. They will also use the stairs rather than waiting for an elevator. The Parisian diet emphasizes fresh, locally grown, high quality ingredients. Processed food is not a common feature in French diets. French people don’t drink soda or juice during the day and generally prefer water when they are thirsty. The French are known for enjoying rich meals and drinking wine on occasion. But they make up for it by eating healthy, lower calorie foods the next day. Cooking meals with fresh ingredients is much better for health and weight loss than eating packaged foods or getting takeout. The French enjoy fruits in a variety of ways such as fruit salads, poached, baked or stewed. The Café Phase is optional for quick weight loss and lasts for 8-10 days. It involves mostly liquids such as smoothies, soups and puréed foods. The Bistro Phase helps you lose weight with nutritious meals high in protein and fiber. You stay on this phase for two or three weeks. The Gourmet Phase is followed to until you reach your goal weight. The meals are designed to be pleasurable, while allowing you to continue to lose weight. Yogurt, skim milk, eggs, low-fat cheese, cod, salmon, halibut, scallops, chicken, veal, beef, lamb, lean ham, Portobello mushrooms, artichokes, arugula, beets, parnips, fennel, broccoli, cabbage, whole wheat bread, soy sauce, mustard, vinegar, olive oil, herbs and spices, chocolate, tea, coffee, wine, diet soda. The following is the sample menu for the Bistro Phase. The Parisian Diet believes that regular exercise helps you lose weight, invigorates the body and increases metabolic rate. You should choose sports and activities that you enjoy and try to stay active for about 30 minutes a day. 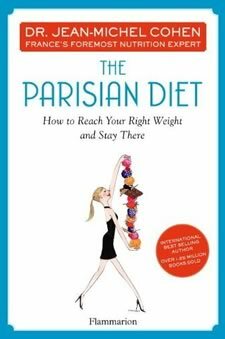 The Parisian Diet: How to Reach Your Right Weight and Stay There retails at $26. Also available is an online program that includes extra features such as 24/7 nutritional support, coaching videos and smart phone access. This is offered for $29 a month with a 6-month commitment. Encourages consumption of fresh, locally-grown unprocessed foods. The Parisian Diet advocates enjoyment of meals and a flexible approach. Educates dieters about proper portion control and awareness of eating habits. Includes meal plans and recipes. Author is a medical professional and nutrition expert. The meal plan may not be practical for dieters who don’t have time to cook every day. Unrealistic for most Americans to take two-hour lunch breaks. The first two phases are restrictive and eliminate most carbohydrate foods. The Parisian Diet is difficult to follow if you don’t enjoy or are intolerant to dairy products. Allows consumption of diet soda, which has been associated with increasing appetite and weight gain. The Parisian Diet will appeal to those who enjoy a structured meal plan and have the time to prepare meals. The benefits of this program are largely associated with learning to reduce portion sizes and avoiding between meal snacks. Weight loss will also occur due to the low amounts of carbohydrates and calories in the menu plans. Continued success is most likely when practicing the principles of the Parisian Diet after completing the three-phase program.